At a recent PFHA judged Trail Horse Test, I am proud to announce that A Cappella's Mesteno a Paso Fino Stallion and son of Capuchino was awarded the SENIOR Trail Horse title. 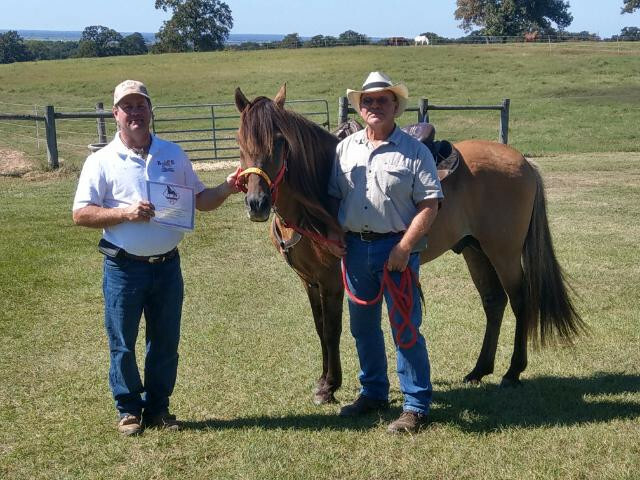 The PFHA Trail Horse Test Program , started by Rick Shaffer is proving to be a great program for you and your horse to participate in that focuses on horsemanship as well as the mind of the horse. I personally love this approach, since this is the way I have been training from day one, and it is gratifying to be able to work with others who share this approach. At the Senior level of the program you horse is expected to demonstrate a higher level of skill, control, and overall good temperment. As some of you may already know Mesteno is a stallion, and some of you at the clinic may not have been able to guess that (without closer inspection) based on his attitude and behavior. This overall temperament, has passed on to many of his offspring and if you own one you already know this, if you don't, you still can have a sound minded even tempered horse that is well suited for trail as well as show. I encourage you to get involved in this program, it's a good way to gauge your skill and relationship with your horse, spend time with other horse people, and develop a safe riding trail companion. Visit my youtube channel and subscribe, create an account on this website and paso-finos.net so you will get email updates on news and events.